I have also been working on my Happy Scrappy BOM with Rosemary Youngs. I have changed my borders and have purchased a lot of this fabric line to make an entire quilt because I do not have any orphan blocks. I will make some different blocks that will fit with the measurements Rosemary has provided. It will be a fun project as I love this fabric. 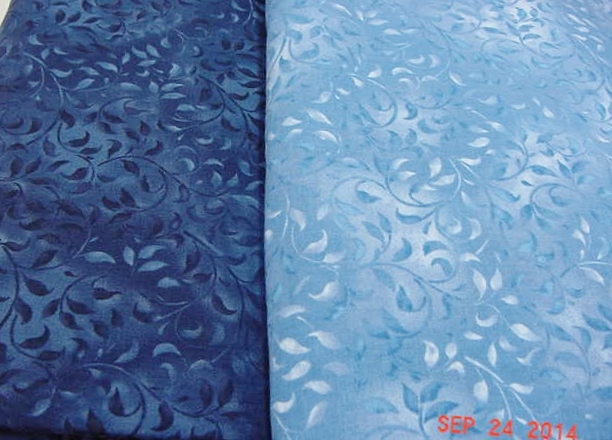 It is a 2008-2009 Moda line that had been set aside for an applique project that was never started. I was lucky enough to find some on the Internet to build up a great stash. For the last border, I decided to make little hexie flowers. I thought I would just put a flower in each corner, but I did not like the look. So I decided to do a vine and that has made the difference. Just need to finish making the hexie flowers. 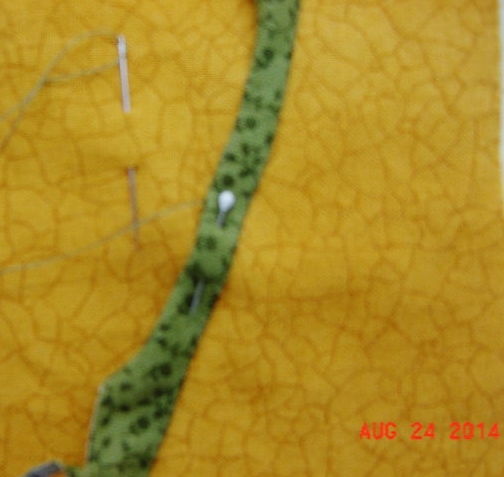 Here is how I do stems for my applique projects. 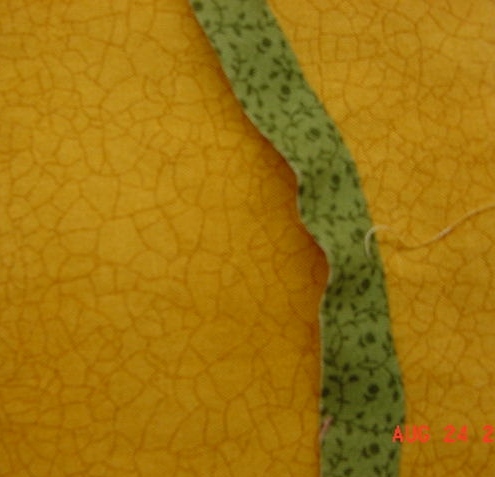 I usually cut a 1/2″ bias strip, applique one side down, trim any excess and then applique the other side. It is quick and easy. 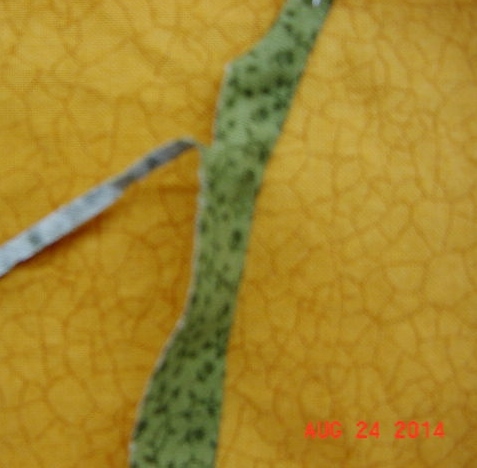 I also use a 3/4″ bias strip if I think I may have problems with fraying. Happy Scrappy Last Border – Final Final! I have made 8 more hexie flowers to fill in the border and think it will look better. Just need to get with the program and finish sewing them together. 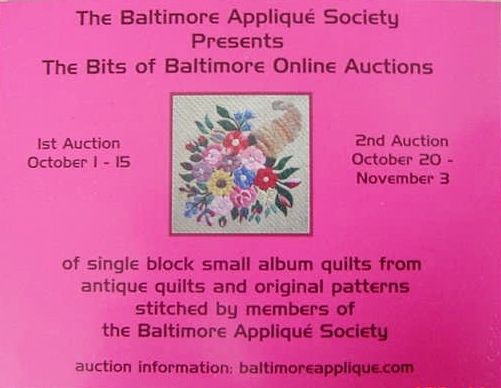 First of all – do not forget to check out “Bits of Baltimore” On Line Auction beginning 1 October 2014. 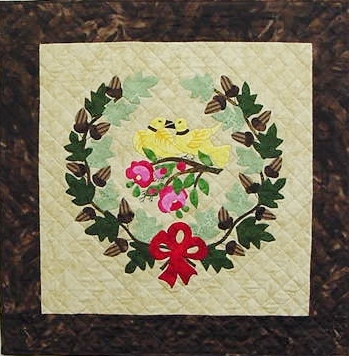 Even if you do not bid on anything there are some beautiful quilts to just savor over. 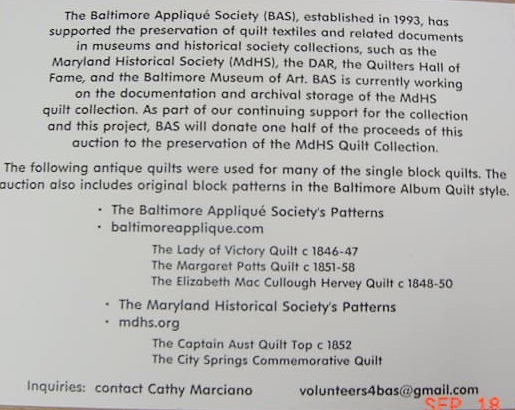 Go to http://www.baltimoreapplique.com for the information. Well, I have finished my Globetrotting quilt!! It feels so great to have accomplished this. Pat Sloan had the BOM on her Blog this year. Pat’s blocks were “ripping” free. This is because she adds 1/8 of an inch to cutting instructions and what a difference! I knew that when I made this quilt there would be less stress and less ripping. All quilters have such a great feeling when a project is completed (oops not quilted yet but to me it is “finished”) I will probably do my own quilting on this quilt. When I started this project I did not realize that there would only be 9 blocks. I did not want to have plain fabric for the corner blocks, so I used EQ7 and reduced the Medallion to a 10 1/2″ unfinished block. Each month I drew the blocks into EQ7 – this always helps in selecting colorways or to change or add a block. So it was easy to print out the 10 1/2″ unfinished block. 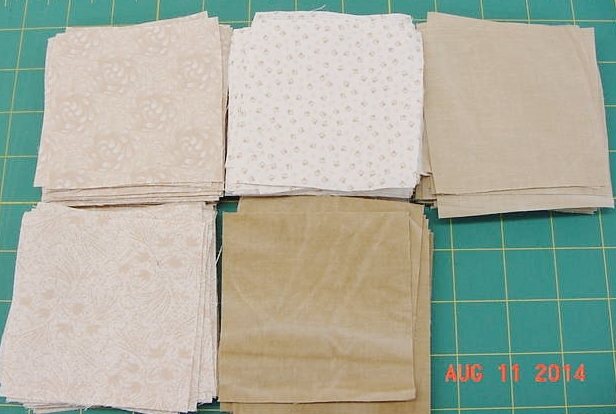 Now anyone who uses EQ7 and ends up with “issues” in being able to square a block I will give you a hint – Always add 1/8″ to any pieces that will be cut and re-sewn… i.e., half square triangles, quarter square triangles, etc. this will provide enough fabric to square them. Otherwise – DISASTER! I decided I wanted to only have a 1″ finished sashing between the blocks – so that meant I had to make 3 more blocks. I used some blocks from EQ7 and modified the Snail Block, made a 9 patch on-point, and added another “star” block. If you follow my Blog – you know that with each project I always learn something new – or have to “remember the hard way” to not do something! 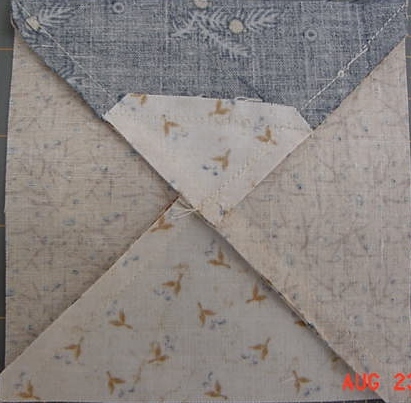 This time I used a fabric for the sashing that was not strong enough to hold the blocks in place. I had problems. 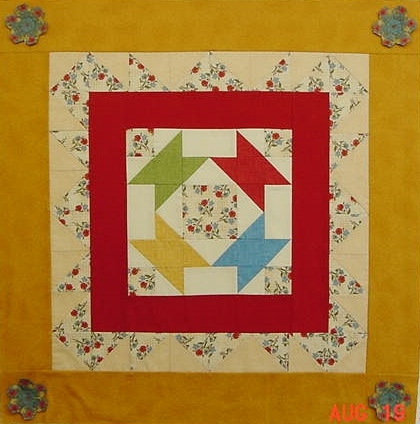 Of course this was after the quilt was already finished – the sashings were off center!! So out came the ripper, I rechecked all blocks, took all borders off of the Medallion and found a 1/8″ issue and after 2 hours that was corrected. 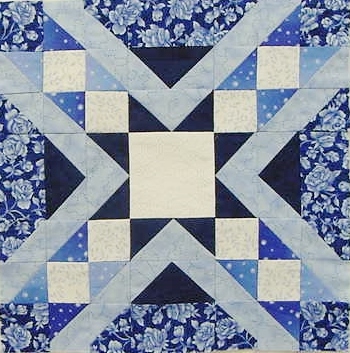 In addition to problems with fabric I found that I did not have any other blue fabric that would really make this quilt pop, so off to the quilt store! I was very blessed because I found the perfect fabric to finish this quilt. When working with this fabric I had to be very careful because it frayed. 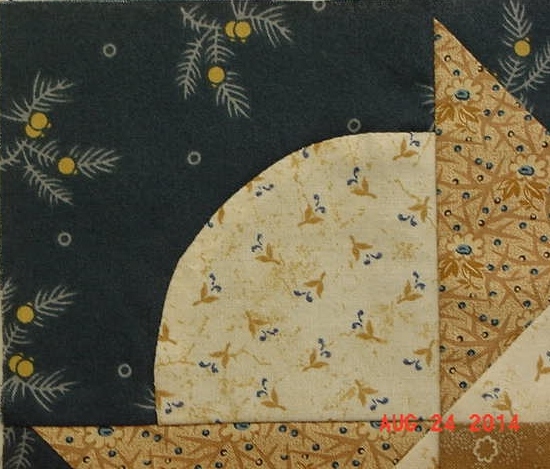 So to stop the fraying before it became a problem, I used the dark blue for the first border for the Medallion, cut the 2nd border, but before I sewed it on to the dark blue border I used sizing to stabilize the fabric (I pre-wash all fabrics because of the chemicals). This was a great help. I had absolutely not one problem with completing the quilt. When I finished it I did a stay stitch all around the last border to keep any fraying or issues before I can get it quilted. 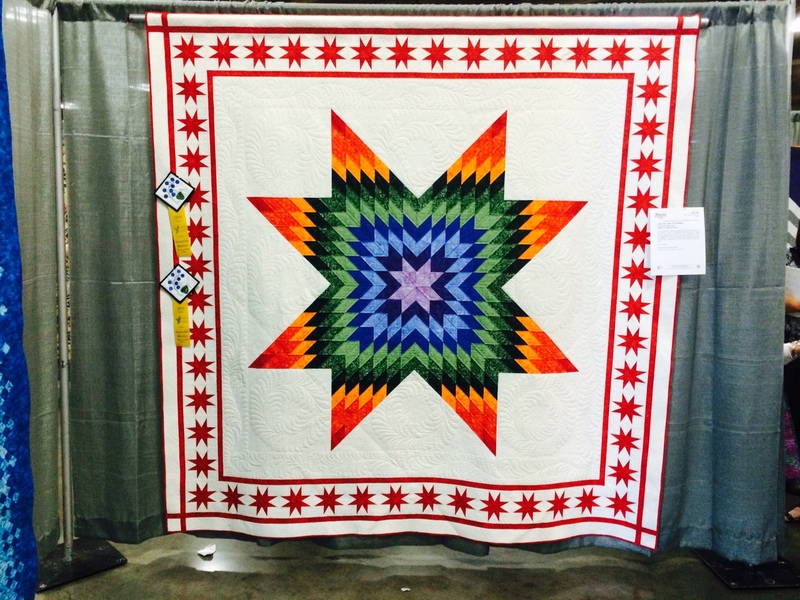 This quilt along with my Red, Grey, and Black quilt provides me 2 quilts for 2015 Quilt Shows! 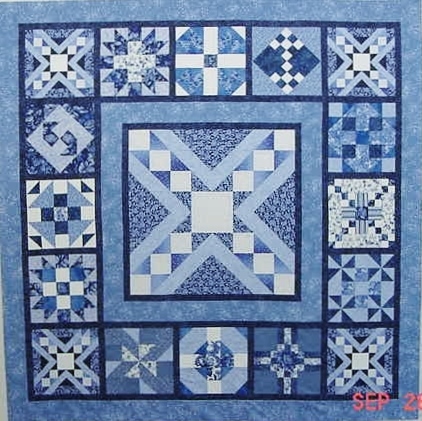 I love the way this quilt turned out – Thank you Pat for the inspiration. Because of precision cutting, squaring, and at times ripping and re-doing. 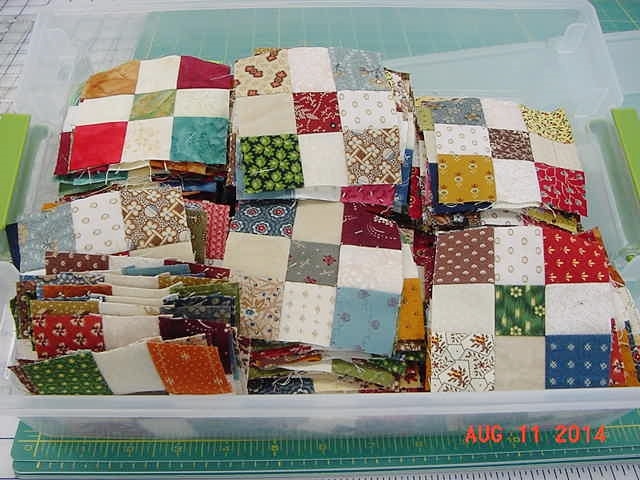 my quilts come out square without having to do the things that I have seen in magazines – i.e., spritz it and pin it to the floor…….Nope not here! Of course some say I am truly nuts being the Type A perfectionist, but I love my quilts because they do come put perfectly square. It has taken some time to be able to do that but all has been worth it. I am going to catch up with Threads of Memory (August and September blocks) and work on Happy Scrappy blocks. But I am also ready to tackle Di Ford’s Mystery Quilt – Just 9 months behind every else! 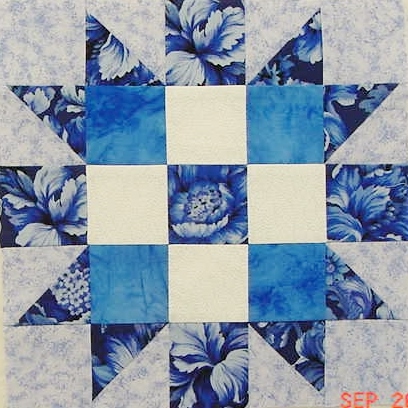 I want to get started on it and have it ready by November so it will be put aside for 2015 Quilt Shows. Wish me luck. We have been receiving some rain last week and Friday and Saturday we were blessed with 2 inches – I can hardly wait for winter – It would be great to have days that are 50 during the day and 30 at night……….I am, of course dreaming! Have a blessed day. This is the first time I have entered the Austin Area Quilt Guild Show. I was so lucky to enter my 3 quilts in the show on the very last day! 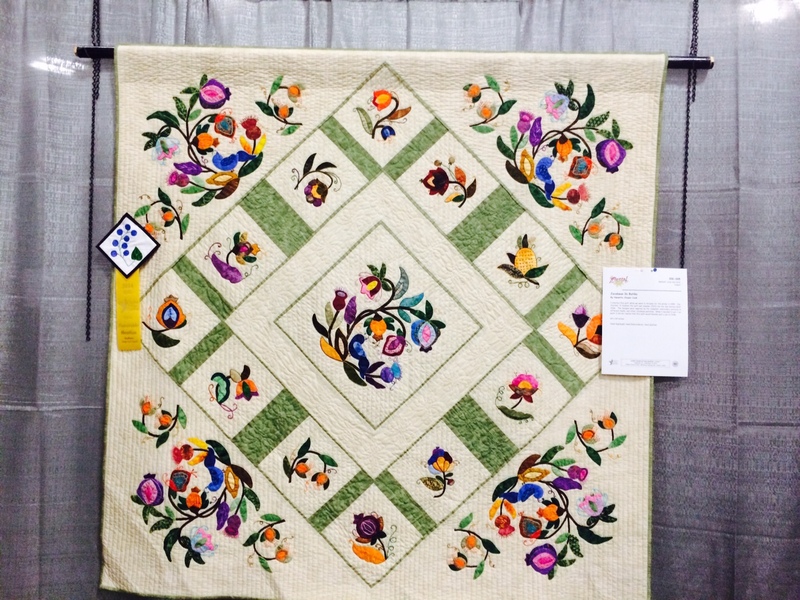 This is unusual for me because I normally try to submit my entries at the very first of the entry time when I enter a Quilt Show. But this year was different so I was very happy to be able to enter my work in the show at the last-minute. Here are my entries with the Ribbons – I received 3 Honorable Mentions – a Ribbon for each quilt entered. I was very pleased. 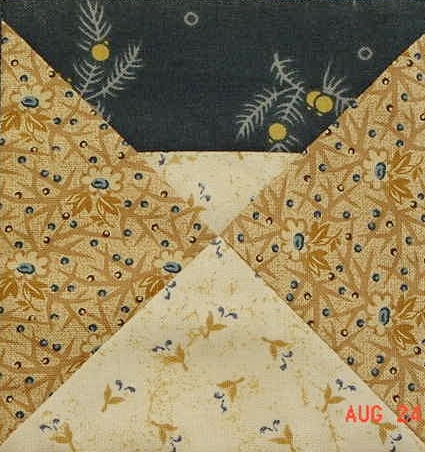 I was not sure if my Jacobean in Batiks and Floating Stars would yield any Ribbon as they did not fair well in the 2013 San Antonio Quilt Show. 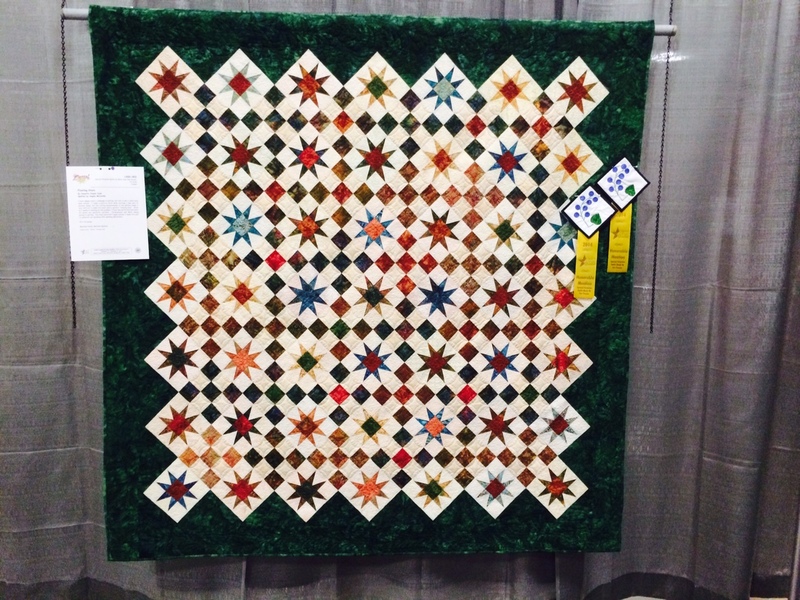 My Lone Star now has a Blue Ribbon from San Antonio 2013 Quilt Show and an Honorable Mention from Austin. 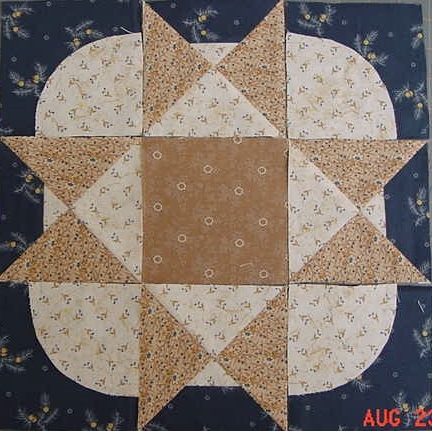 I used Debbie Maddy’s HST pattern and changed the border to 52 Floating Stars – The stars are not paper pieced. I also added another 5 inch light border to give the Lone Star the effect of floating. My Jacobean in Batiks consists of different embroidery designs and inspiration came from Pat Campbell Jacobean works. I designed the Setting. Why in the world I decided to do 5 Medallions is a mystery, I just thought it would be pretty – did not think about all the hard work. I needle turned all the pieces (no glue) and then went around each piece with embroidery thread – what a chore but it makes the applique really stand out. I quilted this quilt after spending 8 days in the hospital with Cat Scratch Fever – YUP – Cat is G-0-N-E! I had 6 weeks to finish it before the 2013 San Antonio show. So needless to say I was thrilled with the Honorable Mention. I am not sure where the wrinkle on the bottom left corner came from – Humm guess it happened while in the bag. 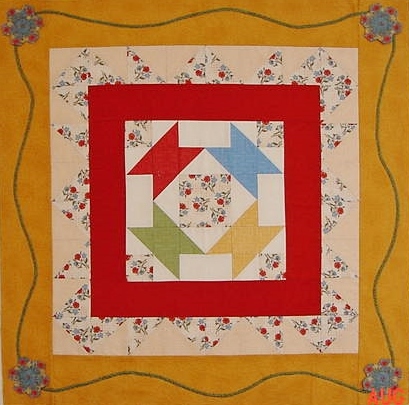 The quilt is hand quilted about with a 1/4″ spacing on the outside Medallions – not sure I will do that one again! 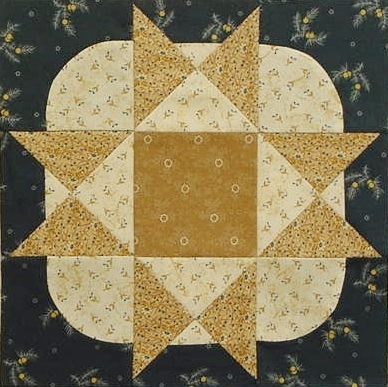 Floating Stars is a pattern from Far Flung Quilts. I made this quilt in Batiks. I had problems with the cutting directions and had to spend some time to do the math to correct them. Again, I am thrilled that I received an Honorable Mention. Have a great day – and thank you for visiting my Blog. Threads of Memory – The remake of the Oberlin Star Block! I have enjoyed working on Threads of Memory and have received so many great comments on my blocks. 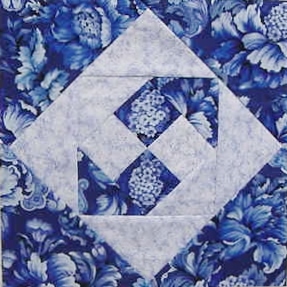 Thx to all who have commented and to Barbara Brackman who put this Block on her Blog. I had some problems with the Oberlin Star block 7 for August. Templates were provided with the block and I made sure that Template A marked 4″ was accurate and printed away. What I did NOT do was check was templates B and F (I assumed they were accurate because it did not indicate to check that one) (Duh). So I made the block and decided to applique the corners rather than mess with the curve. This was the good thing to do – following the Templates was the wrong technique to follow! Here is what happened on that first try! 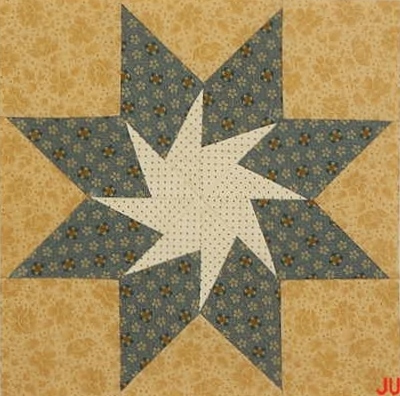 The block should depict the illusion that the star is on sitting on the top of a completed layer of fabric….. Notice the little piece of light fabric that is not centered – it is too small. So I grabbed a ruler and tried to figure out why the center sections were too large! Well, the long side of the template was 4 1/8″ not 4″. This is a picture of how the 2 templates looked from the back – WRONG – Notice the dark blue and small white portion….. It did not work! I decided I would have to go back to the drawing board and decided to apply some math to figure out how to cut the pieces with rotary cutting. 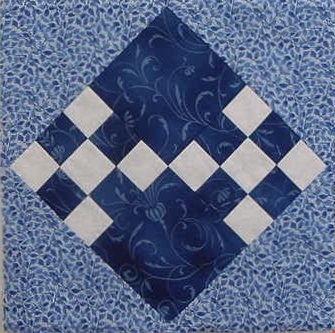 I used Templates A and C to make the corner squares (I hand appliqued the circle onto a square). 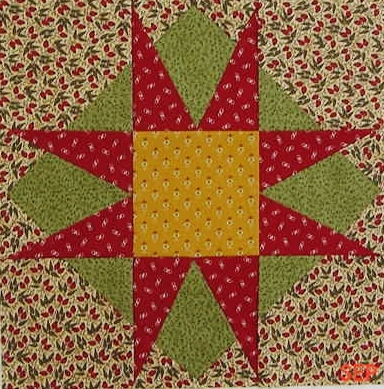 For D I cut 4 each 5 1/4″ squares and sub cut into 8 triangles for the Star Points and Center Triangles. The cutting for E was accurate at 4 1/2″ square for the Center Square. For F – I cut a 3 1/4″ square and sub cut it into 4 triangles. 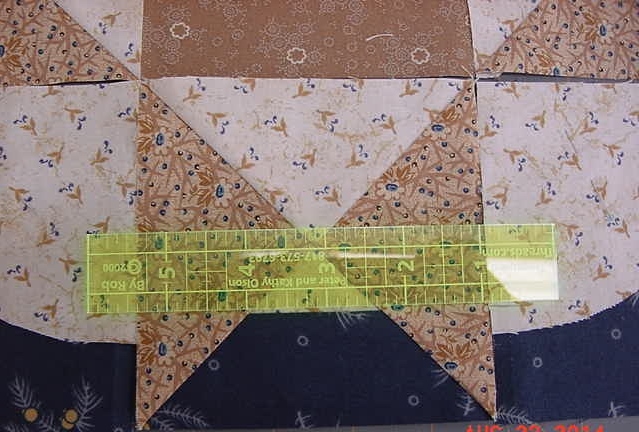 To make the “wonky” Triangle NOT using the templates, I measured 1 3/4″ from the bottom of each triangle cut from the 3 1/2″ square and used the 4 small triangles from the 3 1/4″ square that was sub cut into 4 small triangles for the top. CLEAR AS MUD – right? Well, here is how it came out – absolutely perfect. The only difference in the way I made the block is that my “wonky” little piece of F and B are a little larger than the template. Notice that the block now looks as it should. It was time-consuming to have to take the time figure out a way to achieve an accurate block, but it was fun to do and a great challenge to do the math and finish with an accurate block! Lesson learned on this one – CHECK ALL TEMPLATES BEFORE CUTTING! Have a great day. I am hoping for rain here in our are someday – and a cold wet winter – would not bother me a bit!